In fact, research confirms that quality mentoring relationships can help young people in various areas of life, including personal, academic, and professional. Since mentoring relationships are so beneficial, it’s important to understand what goes into a successful mentorship. According to research, most of the mentors in failed mentoring relationships hold a belief that they should reform, or fix, their mentee. Alternatively, almost all of the mentors in successful relationships believe their role is to support the mentee, or help them develop and grow. Give the mentee a voice and choice in decisions. Let the mentee have control over what you talk about. In order to better prepare yourself for a mentoring relationship, whether you’re the mentor or mentee, let’s dig a little deeper into three of those features. 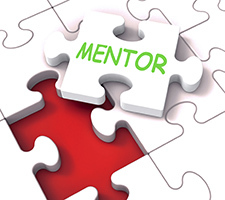 Mentors can be anyone of any age, gender, ethnicity, education or professional level, or background. For example, Big Brothers Big Sisters of America helps volunteers connect with youth in need of guidance and support. The key to being a great Big Brother or Big Sister is being a friend first. Leadership, guidance, advice, and trust come much easier when a friendship is already established. If you are looking for a mentor or already have one, it may be difficult to build trust initially. But, if your mentor’s intentions truly are to help you grow and develop, trusting their advice and action plans can help you get where you want to be in your life, education, or career. And remember – it’s important to look at your mentors as friends, but it’s equally important to respect them as authority figures. As with all new ventures and relationships, it’s important to set realistic expectations. If you go into a mentorship with the goal of changing your mentee, but your mentee’s goal is to stay on the same path they’re already on, there are going to be disagreements and frustrations. Mentors should focus on establishing a positive relationship built on trust and friendship first. From there, the mentee and mentor can set expectations together. Mentees should also approach the relationship with realistic expectations. If your mentor is a business leader, it may not be realistic to expect you’ll land a job with their company because of your connection. Instead of facing possible disappointment in the future, discuss your expectations up front. That way, you’ll be on the same page and you can set goals that will help you develop and grow. Likewise, being positive applies to the mentee as well. If you have a mentor, always be courteous and appreciative of their time and advice. You may not always agree with their suggestions, but it’s important to remain positive when you explain your opinion. When both people in a mentorship are positive and respectful, much more can be accomplished. How do you build successful mentorships? Do you have a mentor? Are you a mentor? Share your story in the comments section below! Previous Post The Results Are In: How Does Your Company Ensure Great Customer Service?